The Coriolis measuring principle refers to the effect that a moving mass has on a body in a rotating frame of reference. The moving mass exerts an apparent force on the body, causing a deformation. This force is called the Coriolis force. It does not act directly on the body, but on the motion of the body. This principle is used in Coriolis flowmeters. The video below uses a simple garden host to clearly demonstrate the effect. Coriolis mass flowmeters are designed to suit your need to measure almost any fluid across any application. Built on the Coriolis principle, these meters measure the mass of the fluids directly, rather than volume and hence they do not require compensations for factors such as temperature and pressure which impact volume and accuracy of measurement. For more information, contact Hile Controls of Alabama by visiting https://hilealabama.com or calling 800-536-0269. 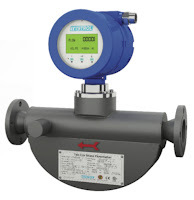 Download the "TEK-COR 1100A Coriolis Mass Flowmeter" brochure here. What is Supply Pressure Effect?